This morning I had thirty miles to go to the Colorado border, which I’ve arbitrarily decided is one third of the way across the country. I tried for an early start, as today’s distance will be the longest since my 112 mile day in Nevada. But I didn’t get away until a little before eight, as I had a discussion with the motel clerk about my supposed free stay. I probably will have to take this up with Best Western if I want my money back. At Jensen, the main entrance to the Dinosaur National Monument is off to the north, and at the intersection, of course, there’s a Sinclair gas station, with its dinosaur logo. There’s an imposing chunk of mountain off to the northeast, in the direction of all them bones. 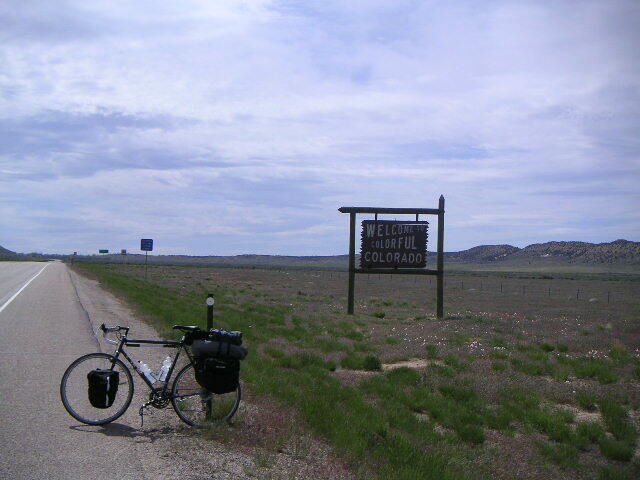 I got to the Colorado border before eleven, then rolled into Dinosaur, CO a little afterwards. There I talked to the state welcome center about motels and camping in towns ahead (unfortunately they didn’t know too much), then went over to the Bedrock Café where they made me a pretty good sandwich and fed me some homemade ice cream. The Bedrock Café is a recently remodeled former soft ice cream place that had been famous for their bronto burgers. Now it’s definitely upscale (for the locale), and the work put into remodeling is very nice. There’s a kind of Memphis effect, with high concept color-stained patterned wood flooring. On then, past entrance number two to Dinosaur National Monument. Somehow I have no recollection of the town of Blue Mountain, but the mountain itself is very imposing. From one side there’s a huge exposed anticline. Apparently it’s a major soaring and hang gliding center, but I didn’t see anyone in the air. Past Elk Springs, some serious rollers made their appearance. There must have been something like ten of them, one after the other, each one climbing a few hundred feet and dropping immediately after. But the grades weren’t too bad, and most of them I went up without benefit of my small chainring. I got to Maybell by five. There’s a town park there with camping and showers, but there’s also an interesting old hotel with an interesting old proprietor. Since the wind was picking up, and since it was supposed to get cold and rainy overnight, I opted for the hotel, and got an earful from the owner about his work as a project manager for trade shows. Apparently he can live here in the middle of nowhere and, as long as he has internet access, put together jobs for Las Vegas and New York trade shows, driving or flying to the site when he needs to. I had dinner at the only restaurant, where the locals told me about the road to Steamboat Springs (not too bad) and Rabbit Ears Pass beyond (really bad). We’ll see. The Maybell restaurant was closed for breakfast, as the owner had to take his dog to the vet, so I made do with some orange juice and powdered sugar coated doughnuts from the town store. But the weather was threatening. The temperature had dropped almost 20 degrees overnight, it had rained, and there was a dark line of heavy clouds on the western horizon. According to the forecast, though, this would yield to cloudy but dry skies early on. I waited for the dark clouds to pass by, and set off around nine. 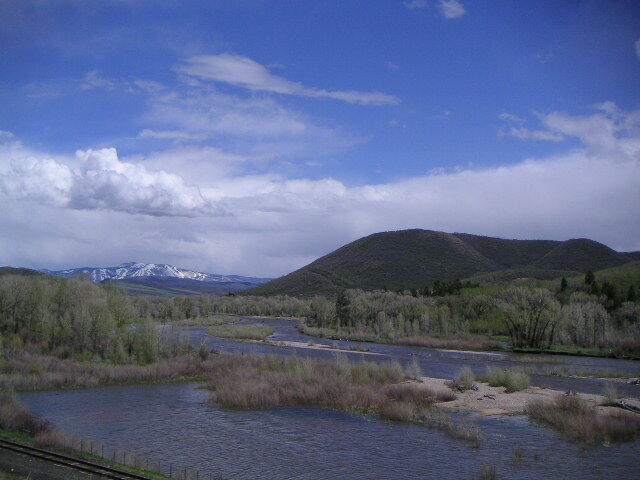 From the map, I’d be following a river most of the way to Craig, and from Craig onward, the road paralleled both a river - the Yampa - and a railroad main line all the way to Steamboat Springs. So I expected a flat ride. And that’s how it turned out. 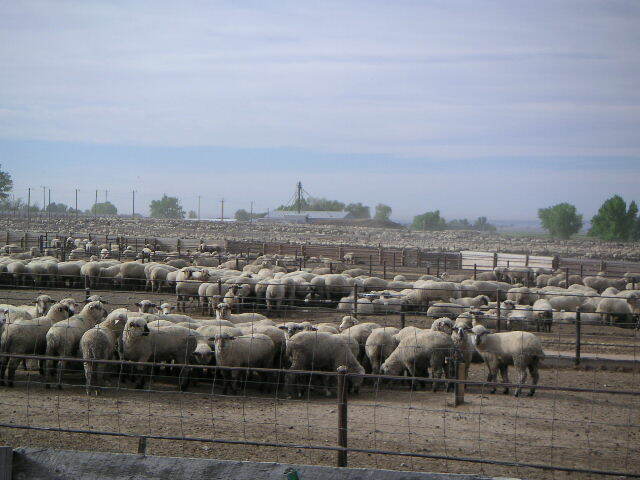 Most of the way it was pasture land or farm land. The rivers were overflowing their banks, and there was a lot of riverside flatland that was either under water or swampy. At Craig, US 40 split into two parallel one-way streets, with my direction being the one through the less nice part of town. By the time the two roadways reconverged, I’d got past all of the possible places to stop for lunch, and I didn’t feel like going back, so I stopped at the last convenience store at the edge of town and asked about food ahead. Apparently Hayden, 17 miles ahead, had a couple of good restaurants. When I got there, Hayden turned out to be a nice town. I would have taken it for a county seat, as I saw at least one lawyer’s office. I ate at a pleasant deli - I was returning to civilization, apparently - and pedaled on through Milner to Steamboat. Outside of Steamboat, there were some very large, nice looking houses - off by themselves, not part of farms. And then at the western outskirts, there was major development, with subdivisions. I rode through Steamboat looking for a B&B I had the address of and also for the Comfort Inn, finding neither one. 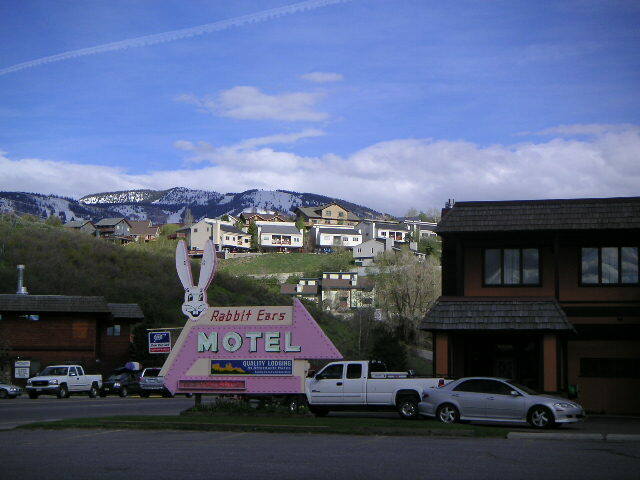 But I stopped toward the eastern edge of town at the Rabbit Ears Motel, which looked fairly nice, was cheap, and it turns out, was built in the year of my birth. 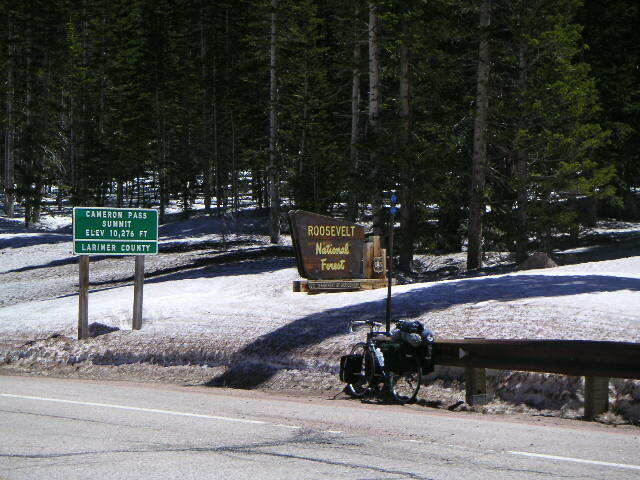 Since I was going to climb Rabbit Ears Pass next, the name seemed like a good omen, and I checked in. My first duty was to do laundry - there was a laundromat in the motel. Then I went to the town library, open from nine to eight, amazingly enough, and did some work on the blog. There’s lots of good food in Steamboat. There are several restaurants with exotic and expensive game items on the menu - elk steaks, for instance - and apparently serious places with actual, real, fresh fish on the menu. But I went to a place that had a Tuesday night prime rib special, ate too much, walked home, and went to bed. Today was a rest day. I had figured I needed a day off before Rabbit Ears Pass, and I had just done six days without a break, so this was a logical day to take off. In the morning, though, I bumped into a cyclist from Boulder who was staying at the motel and who was the organizer of a group of 30 cyclists that had come to town to do some riding here. He said he’d done most of the serious passes in Colorado, and told me not to worry too hard about Rabbit Ears. But it’s just as well to take a day off. I’m likely to take about one off per week from here on in anyhow. I uploaded some photos to the blog from my PDA this morning, then went over to the library to update the blog text to include them in the blog. Then I walked into a clothing shop and asked for a recommendation for a tailor - one of my two pairs of pants needs its zipper repaired. So I dropped off the pants, had some lunch (a grilled salmon steak on focaccia - very good), then picked up the pants (unfortunately she didn’t have the right slider replacement, so the repair isn’t ideal). Then I found a coffee shop, recommended by the tailor, and had a latte and bit of pastry while continuing to update this journal, something I’d started over lunch. I had six days to do, working from handwritten notes. For dinner, I found a fairly high-toned restaurant, where being alone I was seated at the kitchen bar (as opposed to the bar bar), in front of the chef, who fed me salad, seafood fra diavolo, and a tarte tatin. All very good, with the tarte being slightly higher concept than you expect that sort of thing to be (ice cream, caramel sauce, cigarette cookie, mint leaf). It was about 24 miles from town to Rabbit Ears Pass, according to the map. 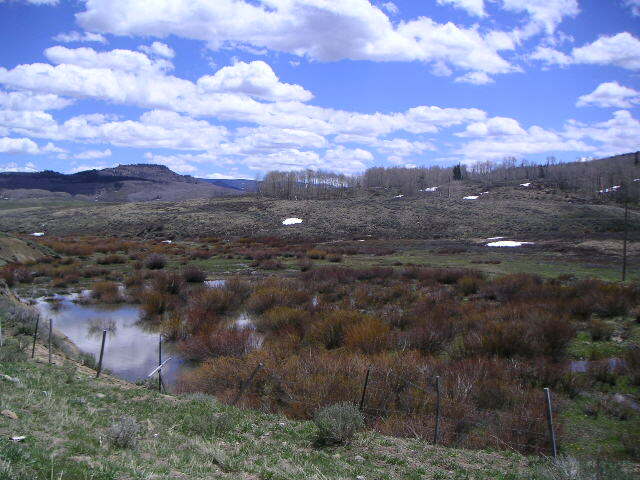 The pass is 9300 feet, 2700 feet above Steamboat. On the way out of town I picked up a pre-packaged sandwich, as it looked as if there was no civilization all the way to Walden, where I planned to stay the night. The climb started at about four miles, and it was fairly steep, and stayed that way. I was resting a couple of minutes every couple of miles, and about eight miles up I figured I had another twelve miles to go. But just then I heard a voice behind me - it was a woman on a road bike, saying, “you’re almost there - it’s just around that bend.” Not quite, but the west summit was only two miles ahead. By the time I got there the woman, and a man who had been just behind her, were on their way back to town. From there, it was either flat or a bit rolling (with one big dip) for a few miles until the east summit and the continental divide, where I found the cyclist I had spoken to yesterday at the motel, along with several of his friends. They had ridden up from Kremmling. 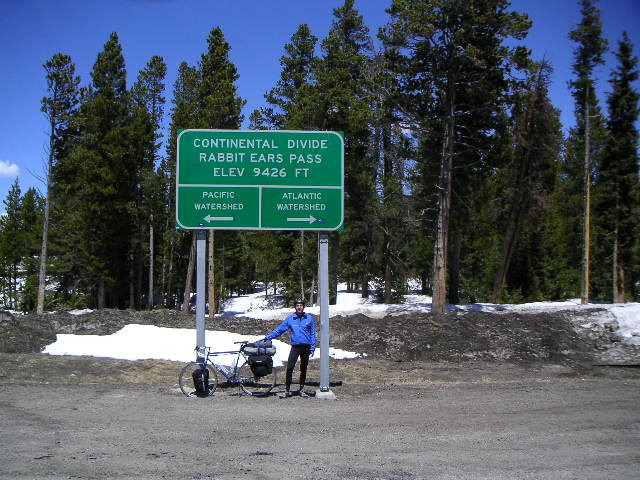 He snapped my picture in front of the continental divide sign, and then I went on down to Muddy Pass, which goes downhill past another continental divide sign. Here I turned onto Colorado 14 and headed to Walden. The road tended downhill though scrub ranchland at first, a little desolate but quite beautiful, with great copper colored expanses of low bushes running along the flooded creeks. Then it flattened out and became very nice grazing land with little irrigation ditches running everywhere, competing with the overflowing streams. There were cows (not steers) everywhere and even buffalo. The colors at this elevation (8000 feet) were astonishing - the deep blue of the sky and the various colors of green all reflected in the water, with pale yellow straw and reeds pushing up through the water of ponds and swamps. There was one last long climb before Walden, where I found a motel, regretfully eschewing the Antler Inn (obviously very nice, here in the middle of nowhere, but a lot more expensive than the motel). But I had dinner in the Inn’s restaurant, two huge pork chops and some cherry pie. Today was to be a high mileage day, the first, really, since Nevada, but mostly downhill. But in the first thirty miles, I’d be crossing Cameron Pass, the highest point on the trip at 10276 feet. The road out from Walden was pretty flat. 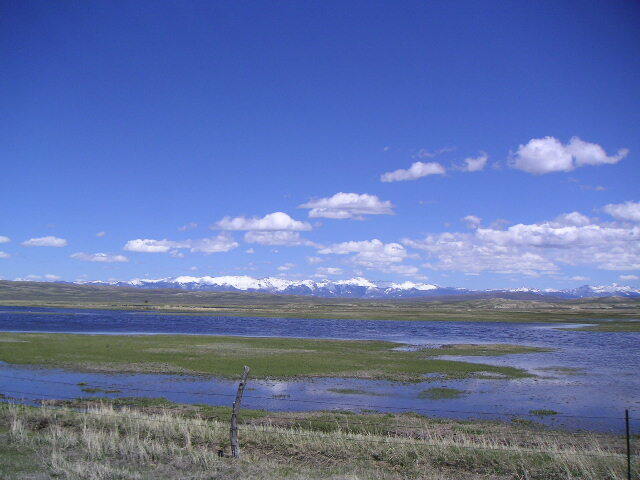 I passed a viewing point for the Arapaho National Wildlife Preserve, which was sited at a point that revealed a huge flat meadow ringed by mountains, called the “bull pen” by the Indians because the mountains effectively kept their game on the meadow. The climb for most of the way to the pass felt nearly flat. I knew I must be gaining altitude, but it didn’t feel like it. But the vegetation was changing, turning from grassland to farmed conifer forest, then to lodgepole pine. About five miles from the top, I did begin feeling the effort of the climb. It got a bit steeper (though never really steep) and near the top I really felt the lack of oxygen. There was a fair amount of snow, as there had been at Rabbit Ears, but it didn’t feel really mountainous right there at the pass, although there was a bit of a gorge to go through at the very top. 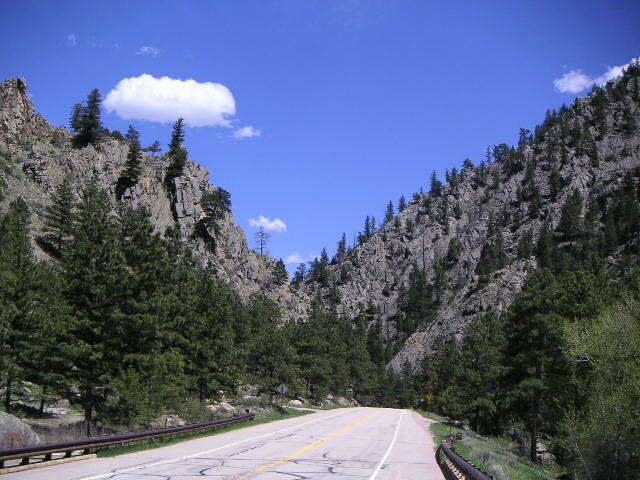 Then - seventy miles of beautiful downhill to Fort Collins. There was some headwind, so I couldn’t coast all the way, and there were some small (very small) uphills from time to time, but until most of the way into Fort Collins, it was a lazy, restful descent. 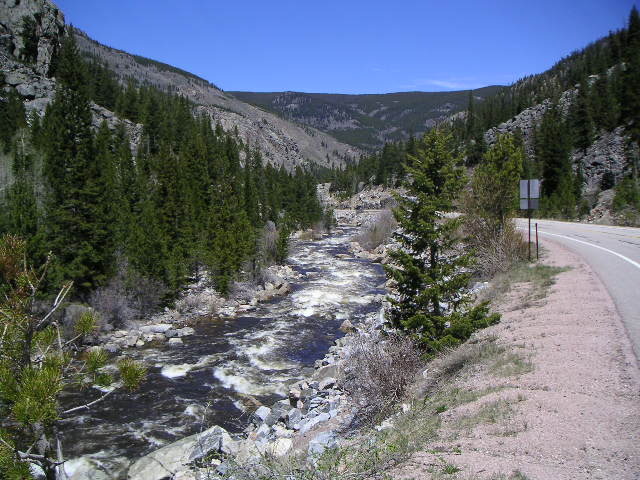 The Cache la Poudre Canyon is beautiful, of course, with serious whitewater. Oddly, although the river was in sight at all times, I saw far more kayaks and canoes on top of cars, going uphill or downhill, than I saw in the water. And it was Friday afternoon - I would have expected more action on the water. 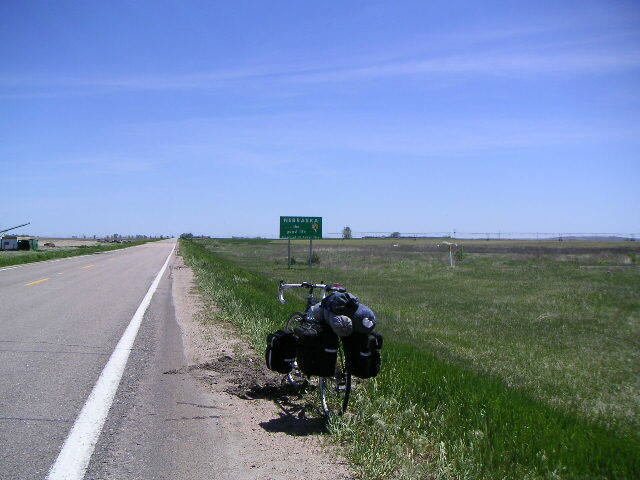 By Fort Collins it was flat, and there were even a couple of uphills, so I was a bit tired when I pulled into town. But I went two miles past town, to where the main north-south interstate runs, and found a chain motel, eating at the restaurant of the motel next door. The direct route eastward to Nebraska continues along Colorado 14, the road I’d been on since Rabbit Ears Pass, so I headed out along that empty stretch of road very early in the morning, as I had another century to do. There was a strong north wind, which was sometimes a little westerly (good), and sometimes a little easterly (bad). And from time to time the road direction would shift a little, into or out of the wind. Altogether, though, I had a bad wind day. 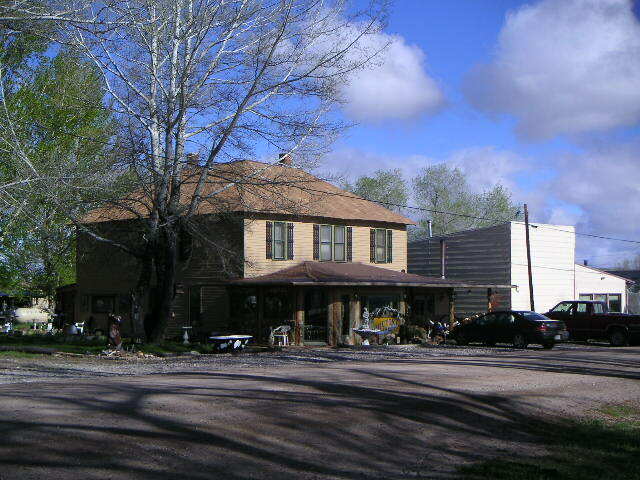 Ault, at 14 miles, was the last town I was confident I could buy food in, so a got a sandwich there for lunch later. Farther on, I stopped briefly for something to drink in Briggsdale, slightly off the main road, a town with two tiny stores and no paved streets except for the bordering county roads. At a little more than halfway, the road construction began. First there was two miles of dirt, where the asphalt was removed completely. But after that two miles, the road surface was merely half-stripped, and grooved. The grooves made it difficult to keep my balance and make holding the handlebars almost painful. When I got to New Raymer and stopped for a Gatorade, the woman in the store promised another eight miles of construction. Eventually, though, I figured out that only my side of the road was grooved; I could ride on the shoulder of the other side in reasonable comfort. So I did that until the end of the construction. A bit before Sterling the terrain started rolling a little. That, combined with the heat - it was in the upper eighties, unseasonably - and the construction I’d just ridden through put me a fairly bad temper as I rolled into Sterling. But I found a motel, again near the freeway, and had dinner, once again at the motel next door. Colorado 14 ends in Sterling, so I’ll be continuing on US 6, which goes in the same direction and is a little better populated. Leaving Sterling means climbing out of the valley of the South Platte, which looks like it shouldn’t be a big deal, but there were some rollers. I think I gained a few hundred feet between Sterling and Fleming. At this point, the towns were getting to be close enough so that I could see the next one’s grain elevator from the previous one. The headwind continued, slowing me considerably. I stopped for lunch in Holyoke, a very pleasant town of about 1000 with a lot of trees. 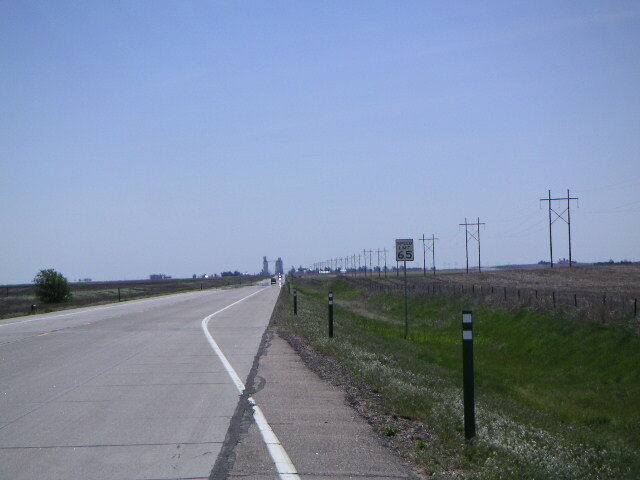 The Nebraska border was now only twelve miles away, and when I’d got halfway there, I met a road cyclist from Holyoke going the other way, just finishing up an 80 mile training ride. He was getting ready for the annual ride across Nebraska, and had done the same distance the day before. We commiserated a while about the wind, and talked about touring - he said he was eventually planning to do a tour from Colorado to Idaho - probably when he retired. So far he’s the second cyclist I’ve met on this trip who was waiting until retirement to tour. My goal for the day had been a state park campground about 34 miles into Nebraska, but as I entered Imperial, 24 miles in, I saw a sign for a B&B, and decided this would be a good place to stop. After all it was Sunday, and I wasn’t sure how easy it would be to get food before the campground. And I felt like some comfort. So I stopped at the Balcony B&B, an old, big, airy clapboard house that had been the original town school, then a tourist camp in the twenties. It was owned by a couple in their forties, with a couple of kids. A nice place. But it was Sunday night, and the only place open to eat in town was a sub-standard Pizza Hut, so I contented myself with sub-standard pizza for dinner.